Reindeer Snack Mix | What about this? Santa and his reindeer have come and gone, leaving not a trace of the Reindeer Snack Mix that was set out for them. They obviously needed to fuel their bodies with carbohydrates for the strenuous night that lay ahead! 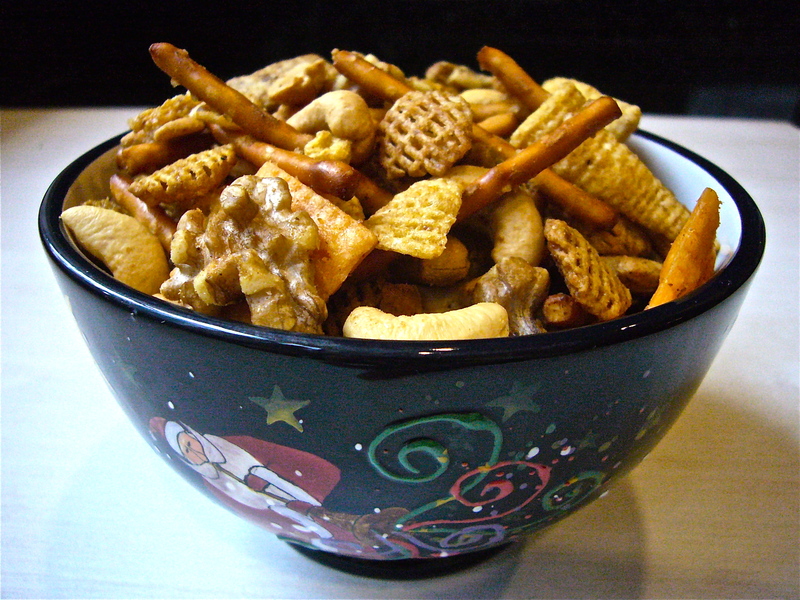 Many versions of Reindeer Snack Mix exist, but this one has just the right combination of saltiness, spiciness, and sweetness so that everyone who comes in contact with it finds it addicting! Why wait until next Christmas to make this Mix? Put it out at your next gathering and watch how fast it disappears! 1. In a large bowl, combine the first six ingredients. 2. In another bowl, combine the butter, syrup, Worcestershire sauce, Cajun seasoning and cayenne pepper. Pour over the cereal mixture and toss gently, but thoroughly, to coat. 3. Transfer to an ungreased 15-inch x 1–in baking pan. Bake, uncovered at 250 degrees F for one hour, stirring every 15 minutes. 1. This recipe lends itself easily to substitutions. I use Crispix cereal in lieu of Corn Chex; pecans, walnuts, almonds and cashews work well individually or mixed; popcorn can be substituted for the shredded wheat (although I feel the shredded wheat absorbs the sauce much better); smaller, stubbier pretzels make it easier to grab a handful than the thin stick ones. I always add more Bugles than called for, because these are the first item to be picked out of the Mix and eaten. I usually double these dry ingredients and mix them in a large roasting pan. 2. In step 2, I add 1/4 teaspoon of garlic powder to the sauce mixture. The level of spiciness can easily be adjusted by adding or reducing the Cajun seasoning and cayenne pepper. Make about 1.5 to 2 times the amount of sauce per batch for better coating. 3. I roast the mix in two shallow-lipped baking pans. Don’t try baking it in a deep pan (such as a roasting pan) because the Mix will take longer to dry out.